Selected as Party of the Day on August 23rd! 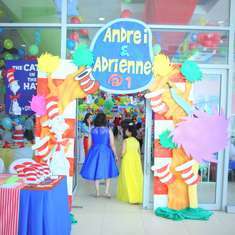 My daughter is a big reader and her favourite books have always been Dr Seuss so what better way to celebrate that love of books than to create a party with her favourite author. 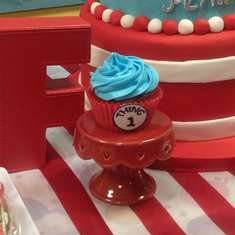 All the food was themed to different Dr Seuss books and the colour scheme was based on the Cat in the Hat colours of Red, White & Blue. Seeing Sophie's happiness on the day, seeing all the kids and parents having fun, watching the kids nearly knock over anything in their paths to find the feet and watching the parents have a go on the giant frisbee once the kids were finished. When one of the littlest kids smashed the frisbee into my husbands stomach from 1 metre away by accident. Sophie telling me it was the best party ever at the end. Cake cake and more cake. 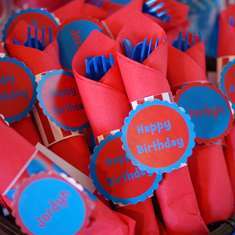 I made ribbon wands for all the kids as well as personalised bubbles, personalised mini lollipops and each child received a bookmark with a Dr Seuss quote that I also made. Wacky Giant Frisbee throwing competition, The Foot Book scavenger hunt, Place the heart on the Grinch and Barbaloot Marshmallow Scramble. 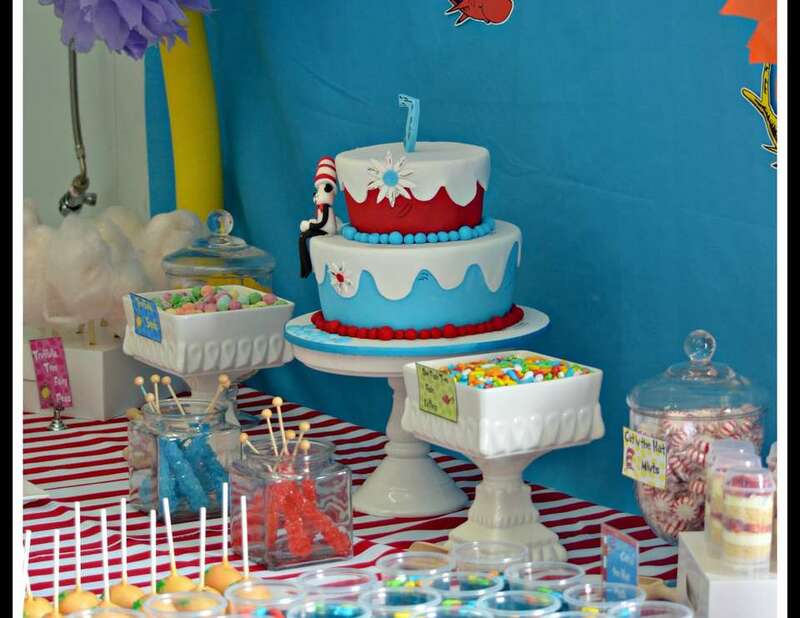 We had star belly cake pops, cat in the hat push pops made from layered vanilla bean cake, fresh cream and strawberries, truffula tree fairy floss, French macarons & much more. 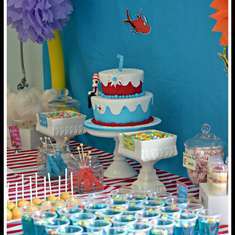 Suzanne, at Taste of Luxury created a Dr Seuss party that looked awesome. Sue at Yeppoon Balloons & Party Supplies was proud to be associated with this magnificent event! Love this! Where did you find your invite template? I've looked everywhere. Where did you get the fish candies? I hope you can help me I have two boys and this August they’ll be turning one and two so we are doing a thing one and two party. But I can’t find any good invites, could you please tell me where you got yours??? ?